If you had to choose your favorite vegetable, what would it be? Have you ever thought about it? My favorite would be Brussels sprouts. They look like teeny tiny little cabbages. In fact, they are actually a variety of cabbage and grow on a stock covered with the tiny spheres. 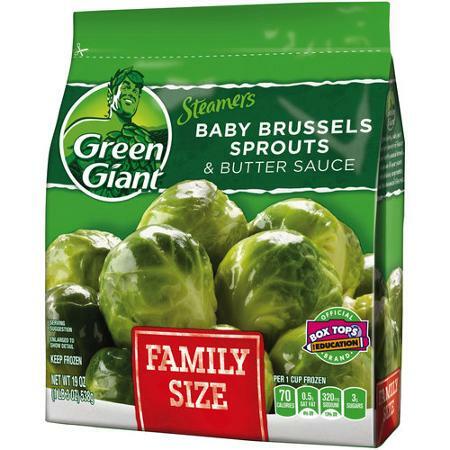 I have a long history with Brussels sprouts, and it started when I was very young. My father used to boil them up, and offer them on the table with mayonnaise to dip them in. They smelled up the whole kitchen, and they looked like little testicles to me (I had a little brother). I literally choked them down. I don’t believe my father even salted them. Plus, they were soft and overcooked although I didn’t know that then. I just know I didn’t like them, but because I was brought up in a house where you cleaned your plate, I forced them down. 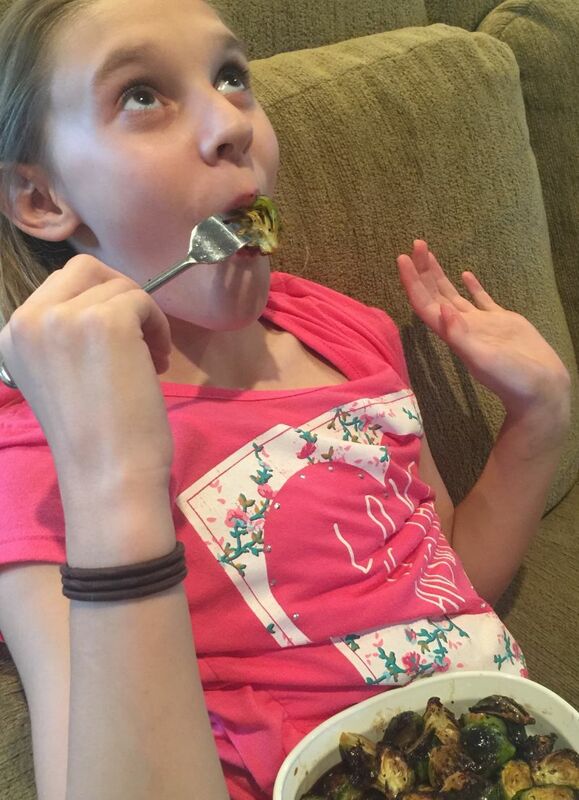 California Girl comments: The Brit HATES Brussels sprouts. I did get him recently to try them roasted but he gave me the scrunched up little kid face from one tiny bite. I lost the battle. It is a shame as I love them. I order them as a starter often in restaurants as I find them yummy and quite the treat. I will have to make these for myself. What a great way to do them! Fast forward 20 years…and a neighbor gave me fresh Brussels sprouts out of their garden. I had only ever had frozen sprouts, so I had no idea what to do with these, other than boiling them to death. Being brought up that you never waste food, I decided to prepare them for dinner and try and make them palatable. I was barbecuing on the patio and decided to toss them on the upper rack in some foil, with salt and pepper and a little oil, and let them roast in the closed barbecue. They had a yummy, nutty flavor that totally won me over, and over the years I have added freshly ground garlic and parmesan cheese to the mix as well. 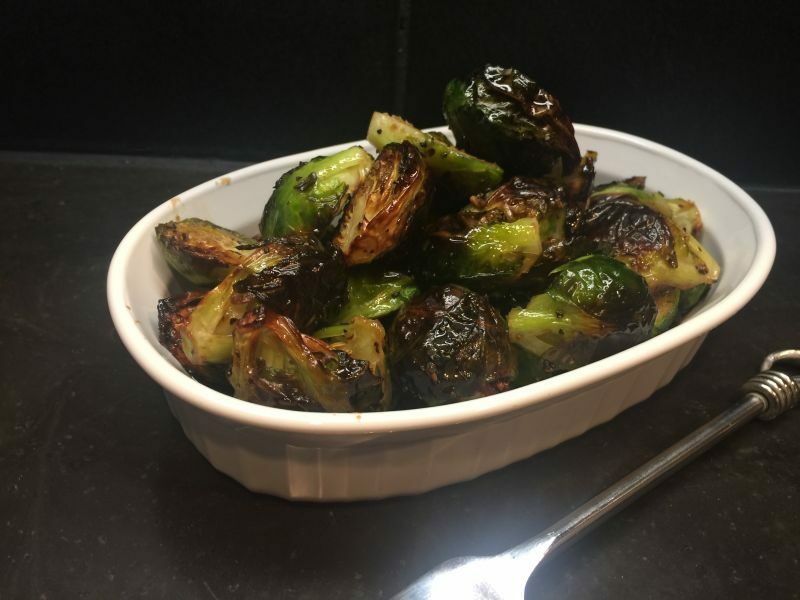 Today’s recipe is a more recent invention: caramelized sprouts! 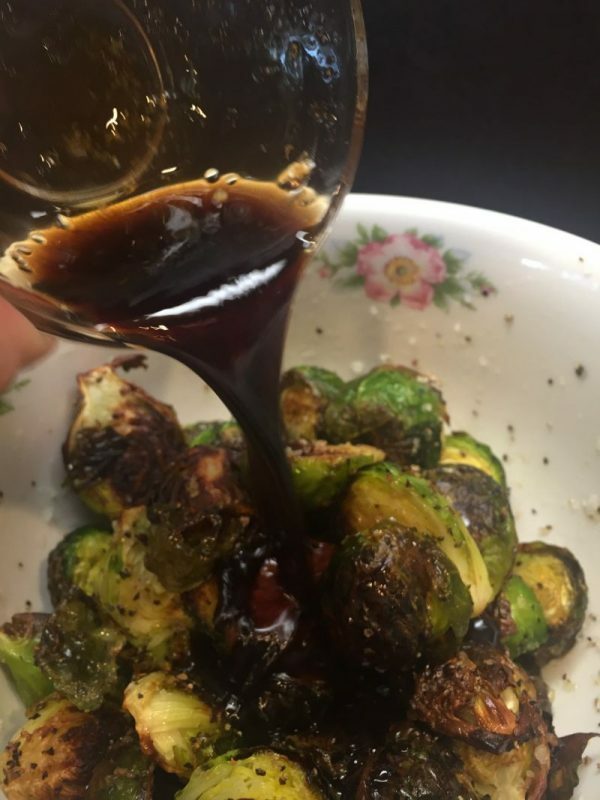 It hasn’t been that long since Balsamic vinegar has become the rage, and it was when I first started experimenting with this new vinegar in recipes that I discovered how delicious it was with Brussels sprouts. Make this just once, and you will find yourself tossing one after another in your mouth! Even my 10-year-old granddaughter goes nuts over them! While I was writing this post, I caught her on the couch, eating the bowl I had just prepared while she watched TV. Turn the oven on to 425 degrees, and line a baking pan or baking sheet with foil. Make it large enough to be able to spread the cut sprouts in a single layer if possible. Wash the sprouts in cold water, then drain. Cut off the dry ends with a thin slice and remove any brown edged leaves. Cut the sprouts in half, lengthwise, and place in a bowl large enough to toss them around in. Add 3 TBSP of the olive oil, salt, and pepper to the sprouts and toss to evenly coat. Spread evenly, and in a single layer if possible, on the prepared baking pan. Bake for 18-20 minutes, until they are roasted and brown on the edges. 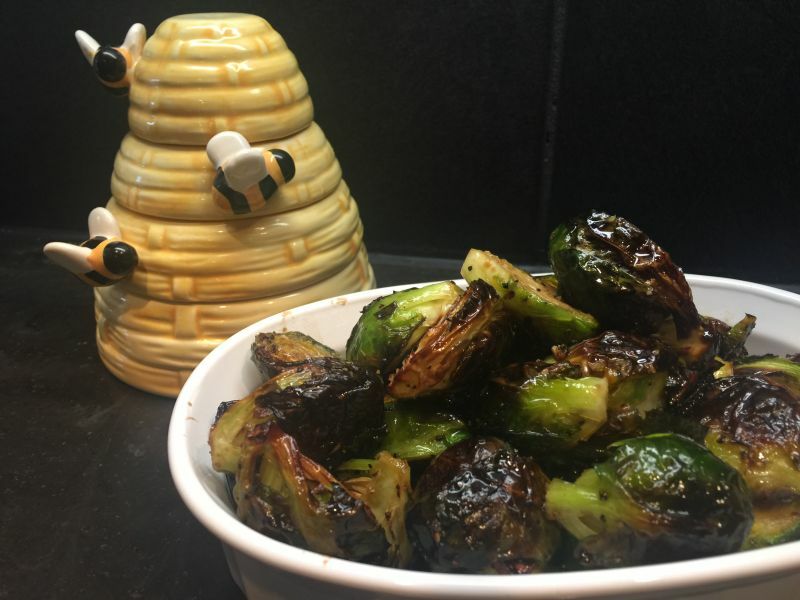 While the sprouts are cooking, stir together the remaining oil, honey, and vinegar in a small bowl and set aside. Remove the sprouts from the oven and slide off into the bowl in which you originally coated them with oil. 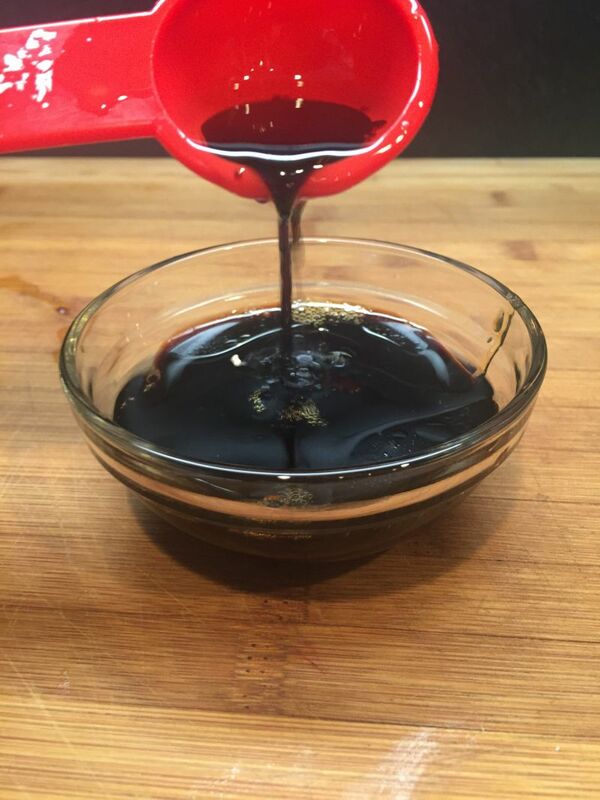 Pour in the oil, honey, and vinegar mixture and toss to evenly coat. Transfer to a pretty serving dish and serve. That’s it. 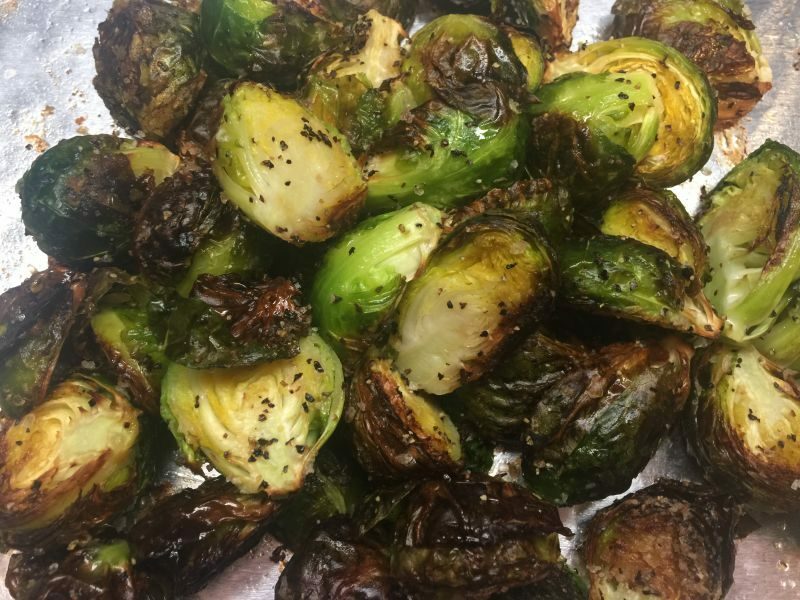 I guarantee you will love these sprouts! Have a great week. California Girl comments: ???? at Miss April! We are a family blog sister! Well, not really; but I couldn’t pass up on the testicles comment. Anyway, on to the pairing with wine. Brussels sprouts, asparagus, and artichokes are some of the very few veggies that don’t pair with wine well. It has to do with their earthy flavors that when you combine them with wine, it just isn’t pleasing. So, how is it you drink wine with them on your plate? You don’t actually pair it with the veggies, you’d pair it with the other elements on your plate. If you want to avoid the unpleasant taste in your mouth, I would recommend taking a bite or two of the food that you are pairing the wine with; in between drinking the wine and eating the sprouts. 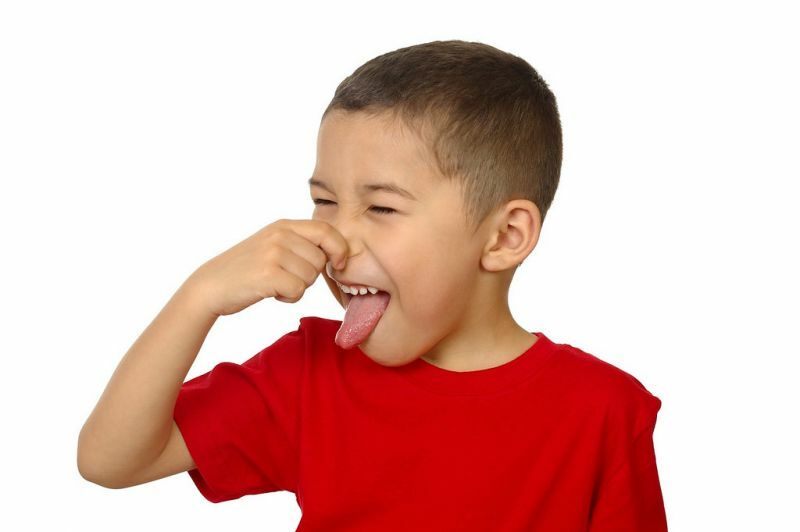 That way you will not have that flavor on your palate while trying to enjoy your wine.